Understanding and managing the total cost of a project is critical to its success. The timing of those costs can also be very important – large up-front costs followed by long delays may put enormous strains on a company’s cashflow, even if the project does not exceed its budget. Tamara offers a comprehensive suite of tools to incorporate the uncertainty and risk associated with costs and their timing, and provides a range of reports to help understand the cashflow risk over time as well as the risk on the total cost to completion. 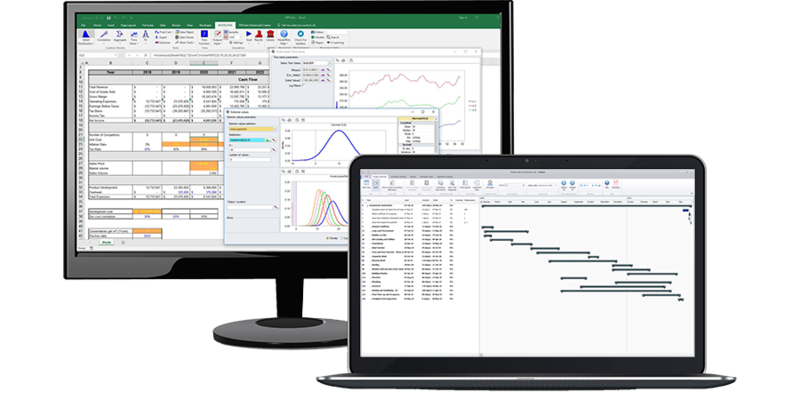 The simulation results on cost and completion dates from Tamara can be further used in financial models built with ModelRisk, if required, so that a business can build a complete understanding of the financial viability of a project. The following description provides a list of the different ways that Tamara can incorporate cost-related risk. Follow the links to review more details on each method. For each type of risk event one may include a cost impact. Tamara will automatically incorporate any additional time-based costs that result from extensions to a task's duration. If a task requires resources for which the cost is dependent on how long those resources are used, then any uncertainty in the duration of that task translates into an uncertainty about the resource-related costs. Tamara will automatically account for this time-related resource cost uncertainty when a resource has been allocated to a task. The uncertainty in resource-related costs is driven by the uncertainty in the amount of time a resource is allocated to a specific task, accounted for in the various task duration modeling tools in Tamara, and by the uncertainty in the cost of each resource required to complete the specific task. Tamara determines an average daily rate for the aggregated costs of all resources attached to a specific task, and then applies that daily rate to the simulated uncertain task duration. Daily rate for electrician cost = (30 x $400) / 12 days = $1,000 / day. Daily rate for telecoms engineer cost = (10 x $600) / 12 days = $500 / day. Analogous to the work amount uncertainty definitions, this allows one to define some descriptive terms to apply to costs. These terms are then applied to resource costs and to expenses. The first column specifies whether the cost is related to the duration of a task. By default, this is checked on – unchecking it will make Tamara calculate the cost from the original unrisked schedule and apply any uncertainties to it. Installation by a contractor of the IT system at a construction site might involve payment for the equipment (material) at the start of the installation (= Start), but the installation costs (labor) might be paid for when the installation is complete (= Finish). The third column, Active Cost Uncertainty, specifies the degree to which the resource cost used in the original model is uncertain. It applies this cost to the resource when that resource is attached to a task that is being worked on. The last column, Standby Cost Uncertainty, specifies the degree to which the resource cost used in the original model is uncertain when that resource is idle (i.e. during a disruption event). Tasks can have additional expenses attached to them within the imported schedule. These expenses can be set in Primavera or MS Project to occur at the beginning, end or evenly throughout the execution of the task. If a faction p of the task is complete, an expense occurring at the beginning of a task is ignored, an expense occurring at the end of the task is included at full value, and for an expense occurring evenly over the task’s duration, a fraction (1-p) of that expense is included. For these revised expense values, the user can apply an Expense Amount Uncertainty factor to the total of the expenses, using the procedure described below. You can edit the entered values by selecting the cell again, removing the uncertainty by clicking the blank line, then reentering a new Custom range. You can quickly assign expense uncertainty to a set of tasks, which is very useful if you have a large schedule. In the default view, where tasks are shown at various levels (parent and child), selecting a parent task and then picking an uncertainty description will assign this expense uncertainty to all child tasks below it. For large schedules, you may find that the easiest approach is to first define the expense amount uncertainty at Level 1 or 2, and then edit for individual sub-tasks where there are exceptions.